Support Railroad Park Donate Today! With 19 acres of green space in the middle of downtown Birmingham, including nine acres of open lawn, Railroad Park is the ideal place to have a little lunch, throw a little Frisbee, take a little jog. More than 600 trees are planted onsite: a mixture of hardwoods, evergreens, and flowering trees. There are 50 Princeton elms, alone. The luxurious landscaping is punctuated with masses of annual, biennial and perennial flowers, making this oasis not only lovely, but a cool escape in the center of a bustling urban environment. Many of the walls and seating areas are constructed from bricks and objects unearthed on the site when Railroad Park construction began. Re-used and recycled objects including hand cast bricks and original cobblestone can be found throughout the park. Railroad Park is 30% water, with a beautiful lake, a stunning rain curtain, a bio-filtration wetlands area and ponds & streams everywhere. These many water features are irrigated by onsite wells. In addition to the paths that wind throughout Railroad Park, the Rail Trail extends the length of the park, perfect for runners and walkers. At its highest point it affords breathtaking city views. The outer loop around the Park is just under 3/4 of a mile. Railroad Park is open 7am-11pm daily. Railroad Park is monitored around the clock by a state-of-the-art security system and by rangers on patrol. Get driving directions to Railroad Park. 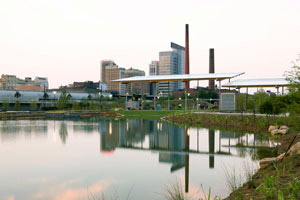 Railroad Park has been open since September 2010 and is proudly owned by the City of Birmingham. The City of Birmingham has a management agreement with the Railroad Park Foundation, a private not-for-profit 501c3 organization, to run Railroad Park. Admission to Railroad Park is free, thanks to the City of Birmingham and the many private donors that donate to Railroad Park Foundation. For information on how to support Railroad Park, please visit our Support page. The 17th Street Plaza is large and partially covered and houses the ranger station, the Railroad Park Foundation office, restrooms and the Railroad Park Dining Car. Two age-appropriate play areas filled with modern playground equipment and a climbing dome invite toddlers and children to play as trains pass nearby. Outdoor gym equipment in the style of Muscle Beach in California offers additional opportunities for good fitness in the middle of the city. A variety of walking trails accommodate runners, walkers, and casual meanderers, including the Magic City Loop (3/4 mile), Rail Trail (1/3 mile), Powell Avenue Promenade (1/3 mile), and Limestone Trace (1/2 mile). Water features make up 30% of the Park, featuring a beautiful lake, striking Rain Curtain, wetlands, ponds, and streams. A designated skate area with three varying sizes of skate bowls keeps some of our young visitors entertained while the more faint of heart observe from benches. Sweeping lawns, picturesque streams and the Birmingham skyline make Railroad Park a prime spot for memorable events of all kinds, such as weddings, class reunions, or family reunions. Contact us for more information on Railroad Park facility rental and to get on the calendar for private events. THE PARK IS OPEN DAILY FROM 7A.M. TO 11:00P.M. Free parking is available along the outer perimeters of the Park along 1st Avenue South. Please refrain from parking in the spaces allotted for the various local businesses that operate along 1st Avenue South unless you are attending those venues. Violators may be subject to tickets or towing. Metered parking is available within a 3 to 4 block radius of the Park. Please be informed that METERED PARKING IS FREE DURING EVENINGS AFTER 6PM AND ON WEEKENDS.